The Verse’s Chanelle Manton reviews Mike Medaglia’s latest book, One Year Wiser: An Illustrated Guide to Mindfulness, released October 2017 by SelfMadeHero. Ever feel like you need to take a break from life and hide under your duvet with a cuppa for a day or two? For me, this is a regular occurrence. Thankfully, Mike Medaglia’s One Year Wiser, which has been accompanying me in my bouts of introversion, has helped me practice mindfulness and be a bit more productive during these tough times. Medaglia combines his practices of art and Buddhism effortlessly in One Year Wiser. With the help of 152 pages of stunning illustrations akin to a graphic novel, the book offers practical guidance to leading a healthier, happier life. Navigating through four sections, named after the seasons, the book takes the reader through a series of themes. Starting with Spring, we explore topics of mindfulness, love, meditation, and valuing oneself; we are reminded how to breathe, smile, and take steps with confidence towards a brighter future. Next, Summer guides us through ideas about gratitude, inner growth, friendship, and simplicity, whilst Autumn helps us learn about anxiety, compassion, our own nature, suffering, and the ego. Finally, Winter helps us reflect on the previous lessons and draws attention to nature, humility, learning lessons, anger, inner peace, and impermanence. By the end, we feel like experts in these themes and have had much time to reflect on such themes. Aesthetically, Medaglia’s illustrations are breathtaking; each page looks like it could be framed and put on the wall. If you’re a sucker for graphic design or illustration, One Year Wiser is a must. The artwork helps us to understand different concepts and, at times, make light of more difficult or upsetting ideas. Meanwhile, each ‘season’ is assigned with a different colour hue, which works wonders for the eye and the mind. In my opinion, combining art and Buddhist teachings in this way is nothing short of genius. At the end, Medaglia’s final words of wisdom remind us of the cyclical nature of life. This was the most poignant for me – almost tattoo-worthy. As young adults, we have a habit of making life difficult for ourselves – I know I do. However, the simplicity and accessibility of Medaglia’s work is beautifully child-like, leaving no room for complication – only for contemplation. The book is aptly named; I definitely felt at least one year wiser after completing it and continue to refer back to it when I feel an impending duvet day. 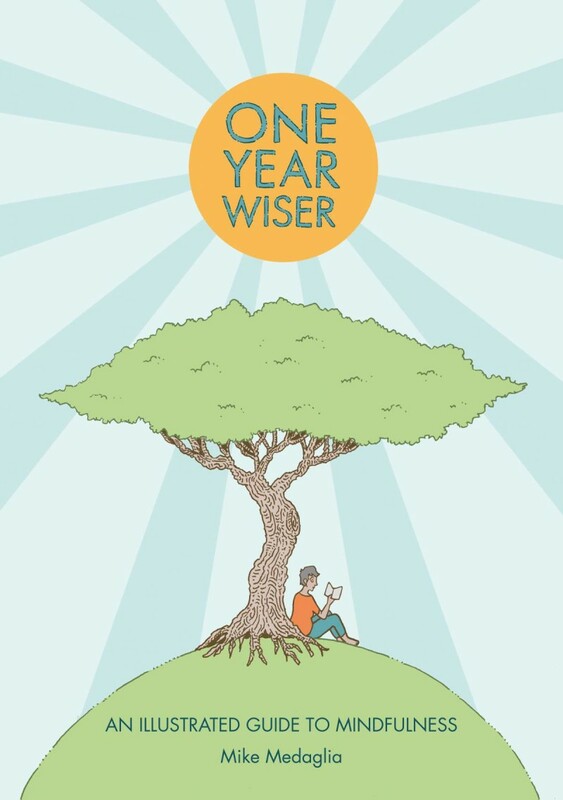 Other books in the One Year Wiser series includes 365 Illustrated Meditations, The Colouring Book, and A Gratitude Journal.